If you read my ‘Majorly Awesome Thanksgiving Recipe Roundup‘ you know that I’ve been thinking about Thanksgiving for awhile – but I have a confession – this week totally snuck up on me. I think it is because Thanksgiving is so so late this year (the latest it can possibly be, in fact), that I kept thinking ‘I have more time’. Sometime during the plane ride home from Toronto last week, I hit panic mode – yes, I had done a huge roundup for recipes, but I obviously wasn’t going to cook all of them. I needed to make a menu for our Thanksgiving meal, pronto. 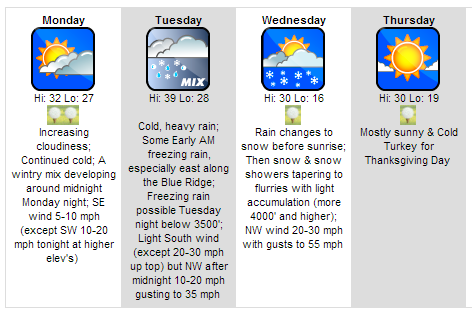 The weather forecast for this week also kicked me into high gear. This year we are ‘hosting’ Thanksgiving at my house. Everyone is sort of scattered this year – but my Brother and Dad are coming to our house, (my Mum is going to her parents – which is where we all usually go). So, it was time to decide on a menu. I hope everyone has a fabulous Thanksgiving! I’d love to hear what you’re cooking up! Hey! My Dad is allergic to Tomatoes…so I was thinking of an alternative. It seems as if the sun dried tomatoes help it stick together. I had thought about dates – but I don’t know what that would do to the flavor. Oh, that’s a great idea! Thank you!!!!! By the way…it tastes beyond amazing. Now to tuck it away in the fridge until tomorrow…so hard to do! THANK YOU!